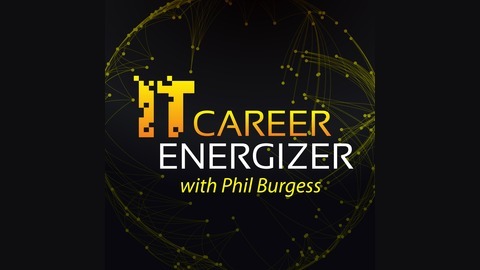 IT Career Energizer is a tech career development podcast where Phil Burgess chats with successful IT Professionals, Consultants and Experts every Monday, Wednesday and Friday about how to start, develop and grow a career in tech. Jeff Atwood (Stack Overflow), Troy Hunt (Have I Been Pwned), Laurence Bradford (Learn To Code With Me), John Sonmez (Simple Programmer), April Wensel (Compassionate Coding), Dan North (Behaviour-Driven Development) and David J Anderson (Lean Kanban) are just some of the 100+ featured guests to date. 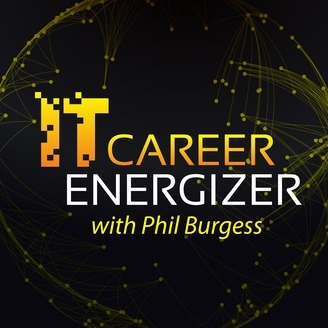 IT Career Energizer was created for YOU, the programmer, tester, business analyst, dba, project manager and anyone who wants to or is already working in tech. Each episode details the journey of a successful IT professional who shares their WORST IT career moment and lessons learnt, their greatest SUCCESS and what EXCITES them about the future of careers in the IT field, and much more. Each episode ends with THE REVEAL where Phil uncovers more advice, tips and insights for you, the listener. Melissa Perri is a Product Management coach and consultant, and founder & CEO of Produx Labs. She has trained organizations and teams on Product Management best practices and has spoken at more than 30 conferences in 14 different countries. Melissa is also author of “Escaping the Build Trap” as well as launching her own school, Product Institute, in 2016. Phil’s guest on today’s show is Melissa Perri. She is the CEO of Produx Labs, a Product Management consultancy, training, and coaching firm. In 2016, she started the Product Institute, which is a 10-week online course, which anyone can take. She also developed and taught the product management section for generalassemb.ly. Over the years, she has spoken at numerous conferences, including Mind the Product, QCon and Lean UX NYC. In 2018, her book “Escaping the Build Trap: How Effective Product Management Creates Real Value” was published. (1.09) – So Melissa, can I ask you to expand on that brief intro and tell us a little bit more about yourself? Melissa starts out by explaining that she works pretty much on a daily basis with the C suite of growth stage companies, mostly CEOs, Chief Product Officers, and CTOs. Her primary role is to help them to work out how to scale their organizations. It is a very fast paced environment, with new people are joining them every day. So, they need to standardize their procedures as much as possible. Melissa’s company, Produx Labs, also has a partnership with Insight Partners, a venture capitalist company. The rest of the time Melissa works with larger organizations helping them to transform the way they work. Her company works with the executive management team then moves on to training their product managers. This gives her the chance to get involved in solving interesting problems at all levels. (2.37) – Can you please share a unique career tip with the I.T. career audience? Melissa’s advice is to always go somewhere you can find someone to teach you. Joining Google as an intern is much better than taking on the role of product manager at a startup. If you work for a well-established firm, they will be in a position to take you under their wing and teach you. (3.23) – So, do you have any specific advice for anybody who may be looking to get into product management? Getting into the field is still tricky. Right now, there is no clear path. If you have been working with an organization for a while you will likely be offered the role. Or a startup will be desperate to fill the position, so will hire you even if you have relatively little experience. Until now, that has been the fastest way into that particular role. Moving forwards, Melissa and a number of her colleagues, are trying to change that situation. They are working on setting up an apprenticeship path or associate pm model. But, right now, her recommendation is to find and follow one of the great product leaders. Choose someone you really admire, reach out to them and learn from them. The other route is to work in an adjacent field, for example, user research or UX. Once you are established, make it known that you want to learn more about the product side of things and take it from there. (4.35) - In terms of the evolution that's going on around product delivery, is the area of product management growing as well? Yes, it is probably one of the most in-demand jobs there is, at the moment. Yet, it is still hard to figure out how to break into this very well paid field of technology. (5.20) – Can you tell us about your worst career moment? And what you learned from that experience. A few years ago, Melissa became the product manager for a marketing platform. She had some experience and had just started to teach others about the field. So, she was pretty confident she knew the right way of doing things. Unfortunately, her CEO did not see things her way. Like most founders, the CEO wanted things done their way. At the time, Melissa did not really have the skills to explain things in a way that would enable her to “bring them along on the journey”. She just butted heads with everyone and got upset when nobody appeared to be listening to the customers. It was a pretty awful experience. But, after 6 months she started to learn how to change her approach. Today, she always tries to see things from the other person’s perspective and adjust her approach accordingly. These days, she works hard to take people with her rather than try to push them down a certain path. She sells to them instead of using brute force. (7.49) – What was your best career moment? For Melissa that was when she had an epiphany moment, fairly early in her career. At the time she was working in a traditional work environment. The CEO would come up with an idea and ask the development team to build it, which, naturally is exactly what they would do. Nobody would stop and ask if that is really what the customer wanted. At the time, Melissa was learning about how to experiment with users as a way to better understand what they really wanted. The firm she was working for agreed to try some of these experiments. It proved to be a very good move indeed. For the first time, the CEO and the rest of the team had hard data that proved what the end customer wanted and what they did not. The CEO recognized the true value of doing things this way. Even though it meant his decisions were being questioned and challenged. It was these experiments that set Melissa on the successful product management career path she is now following. She was also able to position herself as a leader within the organization. Having access to the data made it much easier to have a frank and open discussion and make the right decisions. Often, the data made the argument for Melissa. (10.53) – Can you tell us what excites you about the future of the IT industry and careers? The fact that the technology sector is becoming more dynamic is something Melissa welcomes and finds exciting. New roles are emerging. The creation of UX and UI managers, data analysts and engineers is making a huge difference to how effective developers and product managers can be. These changes are also enabling more people to get involved in the technology field. (11.50) – Are there any particular technologies that interest you or any particular direction that technology is going in? Melissa is particularly interested in the way ethics are starting to play a role in how products are developed. In the past, everyone’s time and energy went into solving the technical problems with very little consideration being given to the social ramifications of what they were doing. That is starting to change. (12.59) – What drew you to a career in IT? Melissa remembers her dad bringing home a magazine with Bill Gates on the front. It was then that her dad first encouraged her to become a computer programmer. She was very young, but it struck a cord. Her uncle worked for Microsoft and she knew she enjoyed playing with computers, so she was actually quite keen to follow her father’s advice. Melissa ended up studying to become an engineer. A lot of her friend’s got involved in the investment banking and financial side. But, she was always fascinated by the technical side of things and wanted to build the products rather than use them. (14.34) – What is the best career advice you have ever received? When she graduated from college she sat in front of a panel and was asked what phase of her career she was on. Was she ready to learn or earn? The panel pointed out that she still did not know that much, so suggested that she might be better off taking positions that would help her to build up her knowledge quickly, at least at that stage of her career. It was very good advice. Even today she makes sure that she is learning continuously. She pushes herself to go in directions that push here to try and learn new things. (15.45) – If you were to begin your IT career again, right now, what would you do? Melissa left college and immediately started working for a major bank in a developer role. It was a very slow paced environment, so she learned very little. She did not have a mentor either. If she were to start her career again she would not dismiss the idea of getting a job where she could have a mentor, or maybe working for a startup. A role that would have pushed her and provided her with an outlet for the energy and enthusiasm every new developer has. (17.16) – What are you currently focusing on in your career? Right now, Melissa is trying to learn more about domains she is not yet familiar with. For example, last year, she got involved in learning about pricing and packaging. She is also trying to get a seat on a company board. (18.14) – What is the number one non-technical skill that has helped you the most in your IT career? Executive presence is Melissa’s number on non-technical skill. If you want to get into leadership you need to work on your executive presence from day one. You need to be a good presenter and sway people with your ideas and data. It is very important to adapt your style to suit your audience, so you can reach them. (19.37) – Phil asks Melissa to share a final piece of career advice with the audience. Once again, Melissa echoes her early advice, which is to go somewhere you can learn. (2.51) MELISSA – "Always go somewhere where you can learn from somebody who is already there." (4.38) MELISSA – "Product management is a growing field. It’s also one of the highest paid fields in the technology industry." (7.19) MELISSA – “Always try to approach it from the perspective of the other person." (14.52) MELISSA – "Are you ready to earn? Or are you ready to learn? Which phase of your career are you on? " (18.37) MELISSA – "If you want to get into leadership, the thing that you really need to hone and work on, from day one, is executive presence."